Michael Allen Wright- Born May 27, 1952, passed from this life May 6, 2018. He was a graduate of Austin Peay State University and Columbia Southern University; employee of Metro Nashville Police Department for over 20 years, including the Metro Nashville Swat Team. He was also an instructor at Nashville State Community College for 20 years. Preceded in death by parents, Roy and Ramona Wright. Survived by loving wife of 47 years, Marie Willeford Wright; daughter Christy (Drew) Jenkel, of Orlando, FL; sons, Dustin (Rebecca) Wright, of Spring Hill, TN; and David (Katie) Wright, of Bellevue, TN; grandchildren, Alex Jenkel, Samantha Jenkel, Maelee Wright, Madelyn Wright, Zachary Jenkel and Michael Wright; brother, Roger (Lyn) Wright; sisters, Rebecca (Rich) Owens and Patricia Abernathy; and numerous nieces and nephews. A Celebration of Life will be on Thursday, May 10, 2018, at 11:00am, at First United Pentecostal Church, 7512 Charlotte Pike, with Pastors, Ron Becton, Dustin Wright, and Roy Duke officiating. Interment to follow at Harpeth Hills Memory Gardens. It was late October of 1988. Perhaps twenty of us sat in the cramped classroom at the Metro Academy awaiting (many dreading) the start of Traffic Crash Investigations instruction when in walks Mike with a look on his face of both quiet intensity, and restrained mischief about to be sprung upon us. The next thing we know, we’re being subjected to juggling, slight-of-hand magic tricks and rapid-fire wise cracks which had us all howling like hyenas in no time at all. The comic relief and entertainment which he provided was sorely needed by all present (I should say captive), and was the perfect transition into what can be the often challenging subject matter which followed. I shall never forget it. Mike was a man of many creative talents and skills, as fellow classmate Brother James Duke and I humbly discovered after a less-than-stellar day on the firearms range during the same time period. It was the “Friend or Foe,” “Shoot or Don’t Shoot” phase of the moving targets training. Yours truly drilled a “Friendly” with several way-too-accurately placed rounds for the crime of turning to face me with a pack of Marlboros in his hand, which can look amazingly like something much more lethal when time is of the essence. At the same time, Brother Duke (I know he’ll forgive me for sharing this) tilled up the dirt at the base of his target like some hot-lead-powered farm implement. At the rear of our shooting line stood Mike, quietly watching, soaking it in, and scheming his next move like a spider with fresh prey trapped in his web. Although my encounters with Mike following our academy graduation were way too few and far between over the years, each one always involved one constant; Laughter. The earthly world which those of us who are still living and breathing share will be a bit deficient on the ‘Jolly Barometer’ as a result of his passing, however I’m quite confident that when Mike appears before the ‘check-in’ staff in heaven, it is likely sounding like there’s a serious nitrous oxide leak occurring due to the hilarious laughter upon his arrival. I am honored and blessed to have known him. 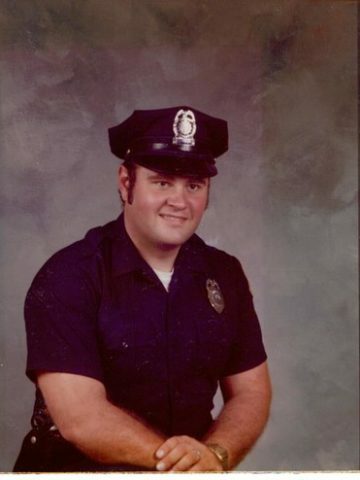 Mike and I were classmates in the MPD’s basic recruit course; September 1973-January 1974. Mike was a good classmate and fine man. Although I did not serve with him after we graduated, I always enjoyed talking to him during in-service training. Mike left us far to early. I suspect God had a good job for him, one that he needs a strong and dependable person to do. My thoughts and prayers go out to Mike’s family. He was my supervisor at Nashville State for several years. He was a wonderful boss and amazing friend. I’ve been trying to find his email for some time now to inform him I finally received my masters degree from Columbia Southern University (he is the one who informed me of the program). He will be greatly missed. I hope to make it to the visitation tonight to pay my respects. What a unique and wonderful man. During my teen years I attended the same church as the Wright family – my heart goes out to them with this great loss. My dad was not a person who gave such praise lightly and he would always say, “Now I like Mike Wright. He’s real.” He was always kind to me. Mike was my instructor and advisor at Nashville Tech for several years. He was always very kind, fair, and accomodating to me. Despite Mike’s best efforts, I must admit that the concepts of drag factor, scuff, and coefficient of friction still elude me to this day. I will remember Mike with respect as a man with a wry sense of humor who cared about his students’ success. My prayers for comfort for his family and friends. Julie and I were very saddened to hear the news of Mike’s passing and sorry we couldn’t make it to the service. I just finished watching the video keepsake.. what a wonderful family and legacy that still remains! I believe Mike and I met at a soccer match. Alex, Mike and Marie’s grandson , played with our son, Jesse, several years ago. In 2004, Mike became a client.. It was so heart warming to see the ‘lighter’ side of him in the video I’d never seen before. Most every time he and I met — he was all business. we will continue to pray for Marie and the whole family. May God continue to bless you all.